In the composite chart, Neptune can show areas where you’ll have a hard time being realistic together and in the relationship, and where you can have difficulties figuring out solutions to issues. With Composite Neptune in the 1st house, there can be great difficulties with seeing one another as you truly are and not as you want each other to be. There can also be a great deal of fogginess in the relationship, and you can struggle to be realistic. You may feel that there is a soul connection between you, but that may just be a feeling and not reality. You need to be understanding of one another and try to be more realistic. With Composite Neptune in the 2nd house, you can have difficulties dealing with finances and your resources together. In a personal relationship, you may find you have trouble holding on to your resources while together. In a business relationship, neither of you may be very good with money, which can tempt you to get outside help, but you have to be careful you aren’t deceived. It can be good if you work together in a spiritual or artistic business. 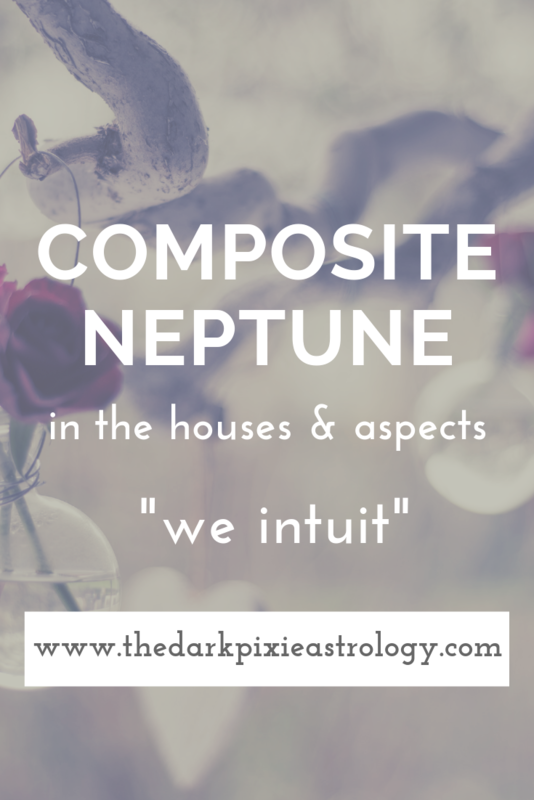 With Composite Neptune in the 3rd house, you can struggle to understand one another intellectually, and you seem to be in a fog when you try to communicate with one another. You may imagine you’re each saying things that you aren’t saying. You have to work hard to see the logic in the relationship. You can develop an unspoken understanding between the two of you, but you need to be gentle with your words with one another. With Composite Neptune in the 4th house, it can be difficult for you to create a life together, if this is a romantic relationship. You may be unsure of how you want to lay the groundwork together. In a family relationship, one of you may be more distant, and it can be hard to come together. Emotions can be important in this relationship, and you need to develop emotional understanding and compassion. With Composite Neptune in the 5th house, this can make you feel you have a soul connection in a personal relationship, and especially in a romantic relationship. You can be more creative and inspired with one another, and can enjoy spending time being artistic, helping others, or using your imagination. In a parent-child relationship, one of you may be more distant, and you have a hard time connecting. With Composite Neptune in the 6th house, daily life may be difficult to grasp with the two of you. You can miss appointments and mess up your schedules with one another, which can bring difficulties in personal and professional relationships. In a business relationship, you need to make sure you’re not deceiving one another or being deceived by someone else. This can be a good position if you both work in the arts or a spiritual practice. With Composite Neptune in the 7th house, you may not see the relationship as it is actually is. You can see it how you want to see it, and you have to work on being more realistic. It may be difficult for you to grasp balance together, but you can work hard to get along well and treat each other with respect. You may not be aware when the other person is having an issue though, so you need to be more open. With Composite Neptune in the 8th house, it may be difficult for each of you to see when things need to change in the relationship until it’s too far gone, or you may see what needs to be changed but be unable to figure out how to do that. Deception can be an issue with this position, so you have to make sure you’re seeing things as they are. There may be difficulties with sharing your resources with Neptune here. With Composite Neptune in the 9th house, you can give each other a lot of freedom to roam, but it may be too much freedom, and you slowly float away from one another and can barely feel it. You have to work to make sure you don’t drift apart. Expanding your lives together may be difficult to do. Differing beliefs can be something that causes you to drift apart, or it can be something that makes you more understanding of one another. With Composite Neptune in the 10th house, you may have difficulty building a foundation and striving toward common goals together. In a personal relationship, you may see the relationship as an ideal, but it may not be reality. In a business relationship, you need to find a way to work together in an unconscious way, not let yourselves be deceived or to deceive one another, and can focus on spiritual or artistic work. With Composite Neptune in the 11th house, you may have a hard time focusing on your dreams together, a fog in the way and obstructing your view. You can be overly idealistic with one another, and you can view the relationship with rose-colored glasses if you’re not careful. This position can be excellent for a partnership that focuses on helping others and being compassionate and charitable. With Composite Neptune in the 12th house, this is the house naturally ruled by Neptune, so Neptune can be somewhat easier here. You can be more compassionate and understanding with one another, and share the hidden together, but you can also have a hard time letting go or moving on from the past together. Come together spiritually and be gentle and giving with one another. With Composite Sun conjunct Composite Neptune, you can be very compassionate, understanding, and feel you have a soul connection with one another, or you can give in to illusion and delusion and not see the reality of the relationship. You need to make sure you’re being realistic about one another and not wearing rose-colored glasses. With Composite Sun sextile or trine Composite Neptune, this can increase your understanding of one another subconsciously, and help you to view one another favorably. With Composite Sun square or opposite Composite Neptune, you can have a hard time sifting through the fog that hangs over the relationship and see one another realistically. There can even be outright lies and secrets, or one of you may make too many sacrifices to “save” the other. You need a dose of healthy realism, and to not get lost in one another. With Composite Moon conjunct Composite Neptune, the connection between you can have a strong spiritual component, and you may feel like this is a soul connection. There can be an element of subconscious understanding of one another emotionally, but you need to watch for illusions and delusions, especially with what you interpret one another to be feeling. With Composite Moon sextile or trine Composite Neptune, you can be understanding, compassionate, and have a subtle emotional connection that allows you to be on a similar wavelength. With Composite Moon square or opposite Composite Neptune, being delusional about one another or the relationship can be a challenge, and you can be unrealistic and easily deceived by one another emotionally. You need to be more realistic and see what’s really there. With Composite Mercury conjunct Composite Neptune, you can be very sensitive to one another and have a subconscious understanding of what the other person is thinking, but you can also be delusional about the relationship and believe you’re hearing from one another what you want, not what is actually being said. Try not to read into situations too much. With Composite Mercury sextile or trine Composite Neptune, compassion can be increased, and you can find ways to communicate with one another beyond words. With Composite Mercury square or opposite Composite Neptune, clear communication can be difficult in this relationship. You may have a hard time understanding one another, and may even purposefully deceive one another, and need to be forthright. With Composite Venus conjunct Composite Neptune, you can be very sweet to one another and have a perfect view of the relationship, but have difficulties seeing the reality of it. You can feel a strong soul attraction to one another, but it can also be a mask for deception. With Composite Venus sextile or trine Composite Neptune, you can find one another charming and compassionate, and you can be more sensitive with one another. With Composite Venus square or opposite Composite Neptune, there can be a certain degree of deception going on, and it may not even be on purpose. You may not be realistic with one another, and see what you want to see instead of what’s really there. Reality needs to set in. With Composite Mars conjunct Composite Neptune, you can be very compassionate and understanding of one another, but there can also be some delusion, and you need to be more realistic about one another and the relationship. You can be driven by spiritual goals together, and can grow together spiritually if you have common spiritual beliefs. With Composite Mars sextile or trine Composite Neptune, you can have a strong soul connection between you and engage in your fantasies together as long as you’re seeing the relationship realistically. With Composite Mars square or opposite Composite Neptune, the relationship can be draining on one of both of you, like it’s sucking the life out of you at times. One of you may be quite sacrificing, which the other takes advantage of. You each need to maintain your own identity, otherwise you can lose it. With Composite Jupiter conjunct Composite Neptune, there can be a strong spiritual connection between you, and you can look at one another or the relationship as your ideal, but you need to be realistic about it, otherwise this can be a deceiving relationship. With Composite Jupiter sextile or trine Composite Neptune, you can be compassionate and understanding with one another, and you can feel that you protect each other or are protected in the relationship. With Composite Jupiter square or opposite Composite Neptune, you can be way too unrealistic about each other and the relationship. You can see what’s not there, feel what isn’t real, and misinterpret situations. You need to work hard to see reality.